I have a 7A28-7049 in NOS condition. Got it with a broken stem, put a new one in and it fits very well. After inserting a Maxell 394 nothing happened. Nothing. Tried it with heat and "kicking" the second hand - again nothing. Movement and everything looks like new. Have you checked the height of the setting lever; making sure it is still making contact with the PCB ? (I think we've been here before). Do you mean no time; no chronograph functions and no self-test ? If that is the case, have you tried swapping the PCB for a known good one ? NOTHING works... Not time, no stopwatch, no self-test. No manual adjustment of the hands. No "ticking". The only thing working is of course adjusting time and day / date manually. Will try to have a look at the PCB the next days. 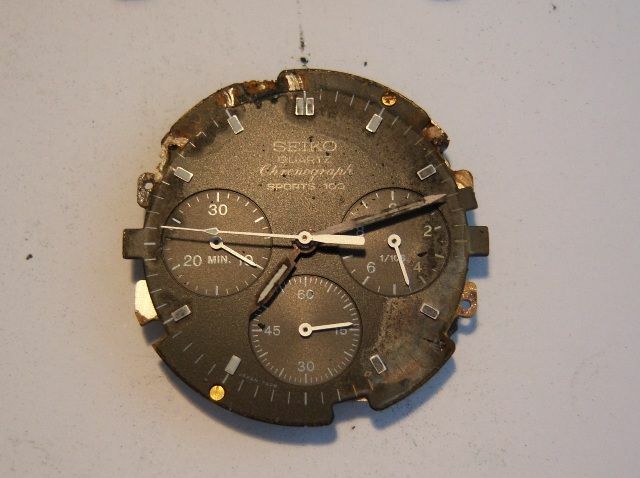 The watch looks like from the dealer - can´t imagine that there should be a fault in the PCB. Whoever broke the crown stem may have bent the setting lever linkage. Guys... That watch couldn´t work at all! Is the PCB still available @ Cousins? Or anywhere else? The good news is that the setting lever appears to have been set at the correct height, Tim ! Is the PCB still available @Cousins? Or anywhere else? Looks like you're going to need one of these, Tim. Luckily for you, although Seiko list them as obsolete, Cousins still have some stock. that you first undo the 7 back-plate screws and eliminate the bleedin' obvious. Aaaaah... I am wasting your time? I understand... I beg your pardon. Am I still allowed to ask questions or is that prohibited? You can close this time wasting thread if you like. Paul. It's a pretty basic first step, Tim. Will try to have a look at the PCB the next days. 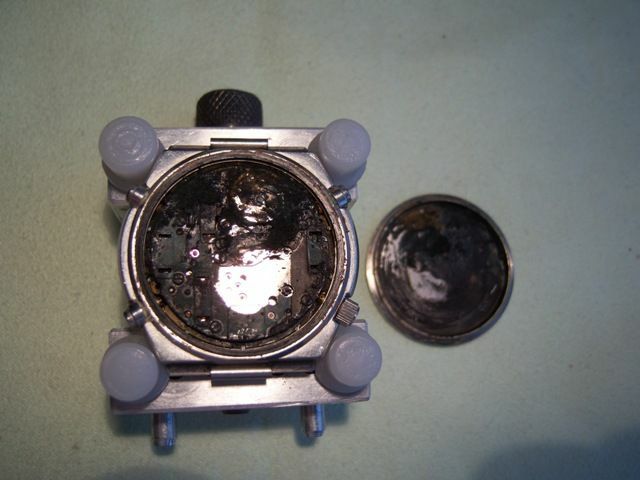 The watch looks like from the dealer - can´t imagine that there should be a fault in the PCB. 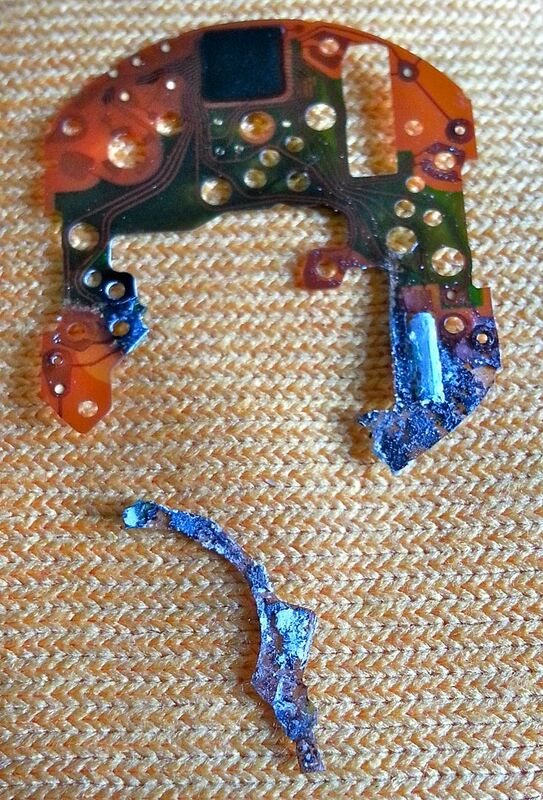 With the state of that PCB, you can't honestly expect us to believe that there was no evidence of battery acid attack visible on the the movement back-plate. Also "basic" first step or what shall I do now? Can there be a fault on the PCB that the 30 minutes chronograph doesn´t move? Shall I oil the gearwheel a little bit? If yes, how do I do that? Well I can't say I'm exactly surprised, Tim. Look at your own first photo. The cause of your 'latest' problem was staring you in the face. No matter how well you may have cleaned up the coil's contacts, I suspect it was wasted effort. The battery acid has probably eaten through the connecting wires. Try swapping it for a known good one. Make sure you've cleaned that switch contact post properly too. So I should change the coil block?! Or the coil contact? How do you clean those contact most efficiently? With Isopropyl-Alcohol? The coil windings and their contact sections are supposed to be one and the same part, Tim (Seiko p/n 4002.726 for C and D). However I suspect when you undo the retaining screw on your 30 minute coil, the gold-plated contacts will probably fall off. Paul. Thank you very much!! And I am very happy!! Thanks again! Perhaps you might post a photo of the repaired watch, sometime, eh, Tim ? I was thinking afterwards. 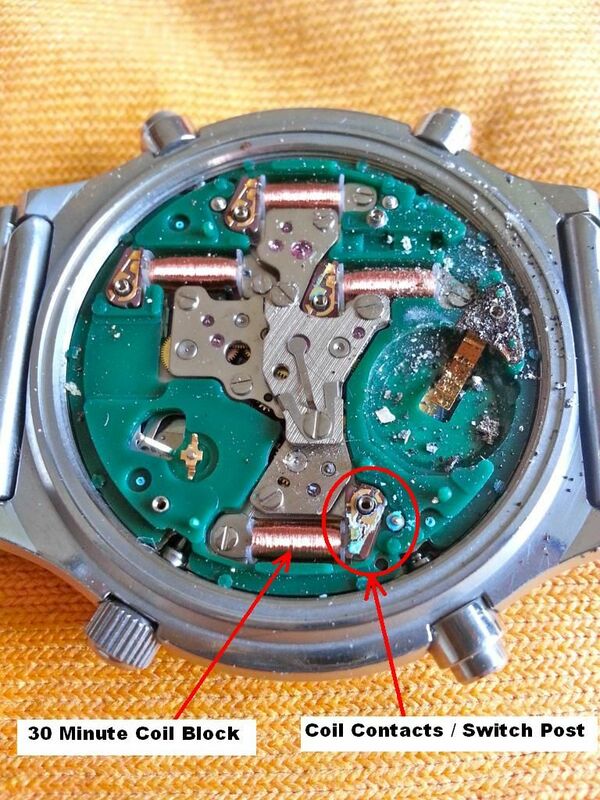 This case of battery acid damage to the movement's PCB is probably one of the worst we've seen recently. Having said that, I doubt anything will ever beat DaveS's 'toasted' 7A28-7070, which he posted on SCWF a couple of years back. Simon (Sir Alan) and myself have encountered it quite a few times and documented it fairly comprehensively in various other threads. Depending on (bad) luck, it can sometimes take very little in the way of battery acid corrosion on a PCB to kill a watch stone dead.